Do you remember the first time a birthday party thrown by your parents crossed over from the realm of "exciting" to "downright humiliating"? Whether or not you recall the classic signs of adult transition, a new film produced and directed by Peter Ferland is bound to remind you. The family comedy, Pirate Birthday Party, follows a pair of enthusiastic parents planning a pirate-themed birthday party for their teenaged son, who has no desire to attend. The cast is made up entirely of locals. Despite the hilarity of the plot and characters, the cinematography has an artistic precision that demands viewers' attention. The colors are stark, and the images almost whimsical. 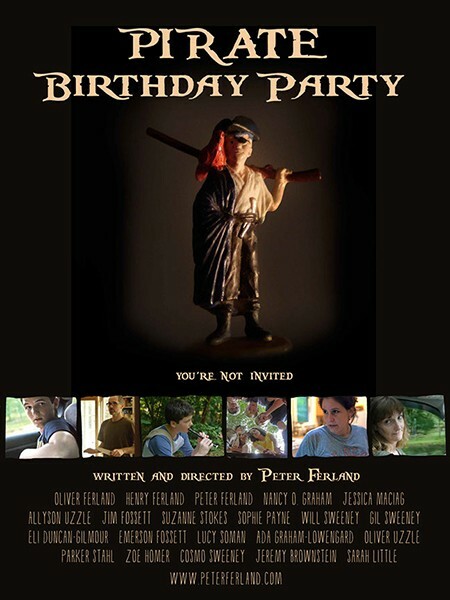 Pirate Birthday Party will be showing at the Rosendale Theater on May 12 at 7:15pm. Tickets are $10. Ferland also wrote and directed the documentary Tending Fires, which follows seven adolescent boys in a rite of passage in the Catskills, where they must keep a campfire lit for 24 hours without assistance. He also worked as a writer on Bereft and Simple Things. In addition, Ferland worked as a producer's assistant for 146 episodes of the hit show, "Frasier."